Build a Footstool with a Leather Top. Click here for detailed leather footstool plans. 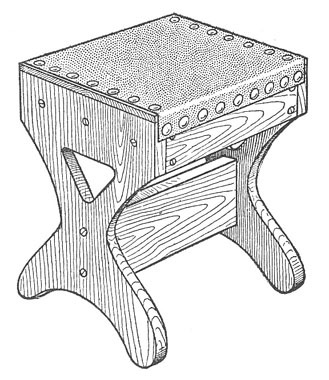 The illustration shows a very handy footstool. 2 end pieces, 1 by 10 by 15 in. 3 cross braces, 1 by 4 by 12 in. 2 end braces, 7/8 by 4 by 8 in. 1 top board, 1/2 by 10 by 14 in. 1 piece of leather, 11 by 16 in. Round-head wood screws and nails. 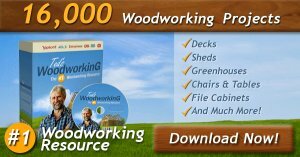 The two end pieces should be marked to a suitable pattern, and may be cut out with a scroll or coping saw, or, if these are not available, with a keyhole saw. The center opening should first be bored at one end and then cut out with the saw. The three long braces should be accurately squared and finished at the ends ; the rigidity of the stool depending on this work. The seat consists of a box form with the open side down. The top is a ½in. board, 8 in. wide by 12 in. long; the sides are formed by two of the long braces, and the ends are the short braces. This box is securely put together with nails, and then screwed in position with round-head wood screws so as to be flush with the top edge of the end pieces. The lower brace is secured in place with screws. In putting on the leather top, ½ in. should be turned under at each end, and 1½ in. brought down on each side. This will provide sufficient looseness to pad the seat properly. Large round-headed brass nails can be used, producing a neat appearance. The stool is then ready for a suitable stain or finish.